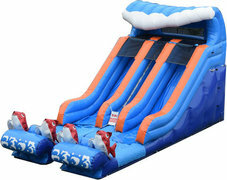 Beat those hot summer days and add a splash of fun to your next party or event with one of our slip n slide rentals! 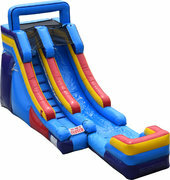 Our inflatable slip n slides are fully equipped to provide your guests with hours of fun as they slip across the length of the slide and splash into the inflatable pool that awaits them at the end! What's more, these slip n slides are decked out with exciting aquatic themes and bright summer colors, and every unit is meticulously inspected and cleaned in between rentals! Perfect for any backyard event or summer celebration, you simply cannot go wrong with a slip n slide rental from Waco Bounce House Rentals! Make your reservation today, and do not hesitate to reach out to us directly if you have any questions!